US Open Cup. Supporters’ Shield. Coach of The Year. Defender of the Year. You might not believe it, but Dallas will be even deeper and scarier in 2017. Finally, some hardware! In 2016 FC Dallas ended a 19-year trophy drought by winning the US Open Cup and the Supporters’ Shield, but fizzled out in the playoffs without the magic of Mauro Diaz, who went down due to an Achilles tendon tear. Interesting how the injury occurred against Seattle and then it was the “#NotMyMLSCupChampion” Sounders that benefited in the playoffs, isn’t it? Real fútbol fans know that the team at the top of the table is the true league champion (eds note: we puked a little in our mouth, too. The homerism dies down from here, we promise). A couple of weeks ago, while listening to Major League Soccer Soccer dot com's very own podcast, Extra Time Radio, Alexi Lalas provided some insight to the emergence Darlington Nagbe. The newly-minted US International and always-minted Portland starlet's blossoming can simply be chalked up to "more touches." It's not that I disagree with that synopsis, but I feel that is too simplistic. Nagbe has been excellent for years. We've seen him time after time change matches with moments that are breathtaking. His biggest problem has always been consistency, going multiple matches without directly being the influence that should be expected from his talent. Of course, "consistency" is just sports fans' code word for "he's not good enough often enough." There are a multitude of tactical questions facing each remaining team in the MLS Cup Playoffs. Can New York's retooled wing-backs be relied on to defend capably? Can the Crew maintain a consistent attack with Federico Higuain's inconsistent performances? 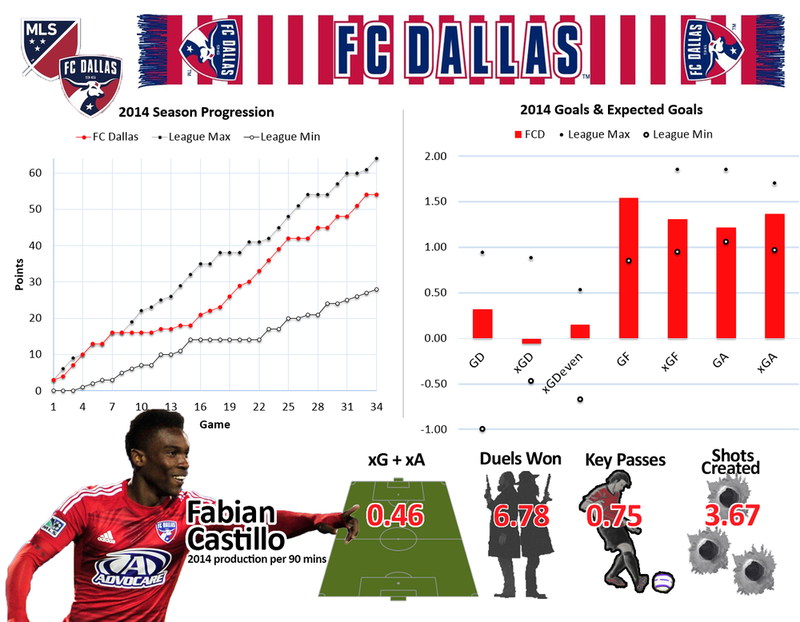 Can anything be done to stop Dallas' attack through Mauro Diaz and Fabian Castillo? And how will suspensions affect Portland's midfield? I'll examine each of these questions and provide a tactical preview of of the Conference Finals below. The idea of a player “position” is too inflexible. The raw data here is collected from whoscored.com. 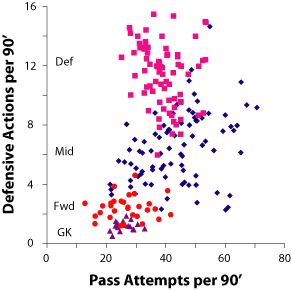 Pass attempts per 90’ accordingly excludes crosses and set pieces. “Defensive actions” are all tackles (successful or not) interceptions, clearances, and blocks. Where deemed useful, I used the position selection option from whoscored (this is an extremely useful tool for reasons that will hopefully become evident over the course of this post) to restrict the player to a dataset which fit into an assembled 11-man lineup (only 11 starters- a potential lineup, were chosen from each team). Although positional differences are apparent in the basic biplot, the accumulation of passes and defensive actions also incorporates aspects of style – the pace of play – which vary considerably by team. To remove team context, I summed up the pass and defense rates by team and converted the axes to share of team actions for the 2014 dataset. We’ll be using the 2015 dataset (raw data collected from whoscored as of April 23rd) through the remainder of this post. These 232 data points have been assembled using a slightly different approach – collecting all player statistics with a cutoff of 270 minutes game time, and normalizing individual numbers to the team average. Players who change positions between games should be expected to blur some position-specific distinctions, but major changes in player role are infrequent enough to be overwhelmed by the general trends. Despite the modest differences in method, the two plots exhibit predictably comparable values – there are a finite number of actions teams can take in a game, and a limited number of general tactical formations used in MLS (and soccer, in general). “Chances” are defined here as the sum of all assists, key passes, and shots. Offensive “touches” are the sum of basic passes, cross attempts, and shots. Evaluating player performance based on skill-dependent statistics is dependent upon a thorough assessment of player behavior. We need player typing to be as diverse as on-field roles, and as indifferent to nominal “position” as possible. The statistics used to characterize type should be characteristic of role and as far removed as possible from player quality/skill (e.g., shooting rate should discriminate attacking players, but the ability to generate shots is descriptive of quality, so it is not useful as a role-dependent statistic). Finally, we shouldn't use so many statistics in constructing a model of roles such that the result becomes overfit to specific players or contains redundancy (e.g. including two different types of basic passing rates – say, short passes and long passes – would exaggerate role difference specific to distribution). I chose a position for pruning the tree (dashed line) that identifies 15 discrete player clusters grouped by role similarity by the four indices (this step is arbitrary this time, but will be automated in the future). Alongside each, I’ve roughly characterized the differences picked up in the analysis on a scale of --- (well-below average) to 0 (average) to +++ (well-above). Notice, if we move the cutoff line to the left to define only 3 groups, these would be primary defenders at the top, wide players in the middle, and central attackers at the bottom. Running a principal components analysis on the same dataset, let’s take a look at the differences between nominal position and cluster identity on the two first axes of variation. Here the short pass accuracy by position is compared to that by cluster (cluster 11 is excluded, since it is simply Fabian Castillo – the point guard man who never encountered a ball he didn't want to dribble past an opponent). Many clusters exhibit a substantially tighter range of values than for the position counterparts – remember that these categories have not been defined by any values that explicitly measure skill or quality. Within clusters (or between closely related clusters) players should show similar statistical performance unless otherwise influenced by skill (as shown with the previously linked example concerning Neagle). No matter how well we characterize situational difficulty (e.g. how far from goal a shot is taken, or the direction, location and length of a pass), constraining the performance of peers provides a more complete characterization of expected result. Providing context for player evaluation is only part of the value of this approach. The performance of individual players is strongly controlled by myriad factors even beyond team and role context. Grouping similar players may allow us to address questions that would be otherwise complicated by sample size. Take, for example, the question of whether any player can be considered to overperform or underperform expected goals. If a style-specific skill in finishing exists, the grouping of similar players – with the resulting increase in sample size – might allow its detection more readily than would be the case measuring goal records for an individual player subject to seasonal noise, team context, and age-related development trends. However, the modest differences between xG and G in the data above should probably be considered a vindication of the model, if anything. Attackers with substantially different on-field roles and shot selection still exhibit predicted finishing success. Still, this approach may warrant further testing in the future with more refined role discrimination and a larger dataset. The four-index model above warrants more work. Some player groups are very effective, but others clearly could benefit from different weighting prior to clustering and/or additional indices. Take, for example, cluster 15 which mainly incorporates central attacking players with fairly average pass share. The cluster also picked up Vancouver CB Pa Modou Kah, who has exhibited abnormally low pass and defense shares for his role so far in 2015. The present dataset may also suffer from limited sample size (any set of a few games may lead to some very unusual game states and corresponding performance). Nevertheless, preliminary work suggests player typing may be a useful analytical tool. Over the past three seasons, fans of the Hoops have seen their team crash down from the high of a 2010 MLS Cup Finals appearance . In 2012, those same fans endured a 13-game winless streak, to be followed by another 11-game winless streak in 2013, resulting in Dallas missing the playoffs each of the past two seasons. What made matters worse was their red hot start to 2013, where they raced out to a 7-2-3 record and 24 points by the end of May, good for first place in the West. After missing out on the post season following such a hot start, Schellas Hyndman was shown the door (officially resigned), and former FC Dallas player and long time assistant Oscar Pareja was hired to right the ship. There is much optimism surrounding Dallas as they look to put the past behind them and get themselves back into the playoffs in 2014. Lots of optimism surround the Hoops after the theft appointment of Oscar "Papi" Pareja as head coach, and for good reason. The former Colorado Rapids head coach was highly regarded by the front office, was a contender for MLS Coach of the Year after Colorado overachieved last season with their young roster, thanks in some part to Pareja's guidance. While the optimism is high, there are also some concerns with the team, as they jettisoned off a few key pieces from last year (Captain David Ferreira, striker Kenny Cooper, and winger Jackson), and now FC Dallas must work through that awkward transition where new faces and a new coach try to get on the same page. Will the front office and Dallas fans be patient enough to wait for Pareja to work his magic, given they've missed the playoffs two season in a row now? His first season in Colorado was forgettable (11-19-4, no playoffs), but there were clear signs of improvement in his second year (14-11-9, knock out rounds). With the exception of Blas Perez, the Dallas attack is young. [Fabian] Castillo (21), [Andres] Escobar (22), and [Mauro] Diaz (22) make for a very dangerous trio if they can develop their chemistry together. Diaz has been handed the number 10 jersey and will hold the keys to driving the Hoops offense this season. Much like it was with his predecessor, Captain Ferreira, where Diaz goes, FC Dallas will follow. And while the short glimpses we saw of Diaz were promising last season, being the focal point and main man for the entire season in a new league is another thing to handle altogether. Last season's Achilles heel had to be the central midfield for Dallas. When holding midfielder Peter Luccin went down with an injury before the season began, FC Dallas was left without any adequate cover, and it lost its midfield bite and any real quality in linking the defense to the attack. That has been addressed strongly this off season with the acquisition of former Rapids midfielder Hendry Thomas (who is basically a tank on cleats) and former Sounder Adam Moffat (better link up player). Not to mention Luccin is back and healthy, and Andrew Jacobson got a good solid year of starter experience under his belt. Dallas' thinnest spot in 2013 has suddenly become their greatest depth in 2014. The Dallas defense looks largely the same with everyone from last year who got significant playing time returning. The debate now is whether that's a good or a bad thing. Jair Benitez is now a year older, and while he provides help in offense (hello golazo! ), his defending remains inconsistent. Zach Loyd had a subpar year by his standards in 2013. Whether he can regain his form that led him to be a USMNT call up waits to be seen. Finally, the last question mark for Dallas is what will Pareja do with homegrown standout Kellyn Acosta? His breakthrough 2013 was a huge step in the right direction for the Homegrown Player program, but where does he fit on this team? In 2013 he filled in admirably---at times better than Loyd at right back---but the teenage star has spoken that his preferred position is defensive midfield. Regardless of where he plays, Acosta is a talent that needs to see the field as much as possible. FC Dallas finished 2013 as the epitome of average statistically, posting the 10th best expected goal differential, as well as the 10th best shot attempt ratio. Hope rests in Pareja's ability to work with a team that has added six new players to date, and to inject this team with a little magic that worked for Pareja's former team last season. Crowd Sourcing Placement: 8th place in Western Conference; 107 of the 406 8th-place votes (26.35%), and 321 of 404 (79.5%) of voters felt that FC Dallas would not make the playoffs in 2014. *ExpGD is the same as our metric xGD.